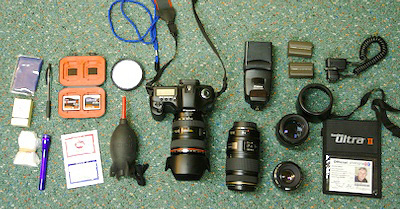 Now that I've piqued your curiosity, it's time to listen to today's audio show titled, "What's in my Camera Bag." You can download the podcast here (28 minutes). Really useful episode; thank you!! I came to the show notes looking for a link to the flickr site you talked about in the podcasts, where I can print a credentials card. Couldn't find it. Can you point me in the right direction? Great PodCast! Thanks for the Flickr badge link! You mentioned FW 800 card readers. Checking the web, it looks like the SanDisk reader needs an Extreme IV card to take advantage of the increased throughput. True? The webpages I saw aren't very clear about this. Useful with Extreme III cards or less? Hi Chris, Yes, I think for maximum speed, you need the Extreme iV card with the FW 800 reader. I have that combo, and it does upload quickly. But I also use the reader with Extreme III cards, and they seem pretty darn fast too. I think most FireWire readers -- 400 or 800 -- are going to give you pretty good performance. I like the collection but I just digi cam and extra lenses in my bag.Your stuffs are too much to have for me.